In January 1959, Lester Young was in Paris for a series of concerts at the famous Blue Note Club. He plays with Rene Urtreger on piano, Kenny Clarke on drums, Jimmy Gourley on guitar and Jamil Nasser on bass. On March the 4th, 1959, Eddie Barclay decides to record Lester at Studio Barclay, which will be his last album. This legendary recording session is poignant and moving in line with the from Coleman Hawkins 'Sirius' and the last recording of Billie Holiday. 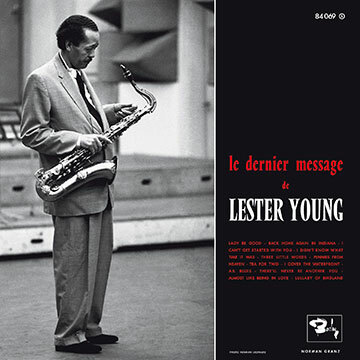 Lester Young is reduced but the grace and genius are still there! Some days later, March 15, 1959, Lester succumb at the Alvin hotel, a few hours after arriving in New York. A heart attack had just one defeat all musicians nicknamed ‘Prez’, The President. Fac-similé re-issue using the original photos of Herman Leonard, re-mastered from the original master tapes. Limited édition -750 copies- 180 grs vinyl pressed by Pallas in Germany. Founded in 2011 by Fred Thomas, Sam Records presents this great reissue. In the tradition of labels wholly devoted to vinyl re-pressing, Sam Records puts out a product of top-notch musical and visual quality. Our re-pressings pay tribute to the people – the musicians, producers, labels, photographers, graphic artists and sound engineers – who created the original recordings that have become enduring legends of 1950s and ’60s jazz.